The latest news update from Professor Barry Kemp, from the Amarna Project. On October 14th the current Amarna field school began to assemble, five overseas students and seven SCA inspectors (drawn mostly from the Middle Egypt region) converging on the Amarna expedition house. The theme of the field school is survey, both in the mapping and planning sense and through the appreciation of human impact on the landscape. Amarna is ideal for these purposes, offering a variety of reasonably clear examples and opportunities for instruction. This year's venue for instruction in planning and profile drawing, using a total station, basic measuring and drawing tools and aerial photography from the expedition's helium photography balloon is the Great Aten Temple, and more particularly one of the broad spreads of gypsum concrete on which are marked the outlines of large numbers of offering tables. The weekly exercises in archaeological landscape appreciation take in the South Tombs Cemetery, the area of the city around the house of Thutmose, the Stone Village and the tomb of Panehsy and surrounding territory. Evening lectures and visits to other sites complete the programme. 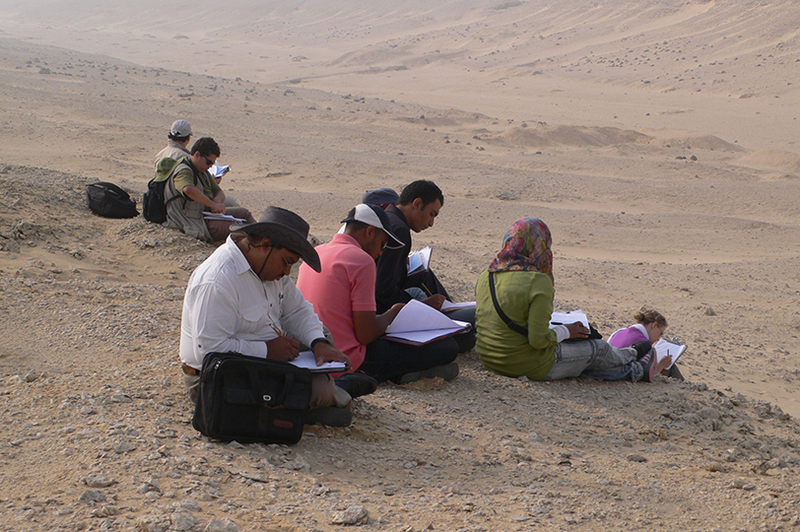 The field school is run in conjunction with the Institute for Field Research (IFR) of California (info@ifrglobal.org) and with the agreement of the Supreme Council of Antiquities of Egypt and in particular with the support of Dr Abd el-Rahman El-Aidi. We are grateful to Dr Hans Barnard, Gwil Owen and Miriam Bertram for volunteering their services as instructors. The clearing of the gypsum surface of the first court of the temple has revealed a surprising fact. The area is surrounded by an embankment of dusty sand, about 1 metre high, with a thick capping composed of gypsum concrete that is the remains of the floor that originally spread across the entire temple. The sides of the embankment have slumped over the years. In the course of cleaning back the edges it has become clear that it contains fragments of fine sculpture and pieces of carved inlays in darker stone. The fragments include pieces in indurated limestone (evidently from a large and ornate architrave), travertine, granite and quartzite. We must conclude that, before the final phase of the temple was completed, fine pieces of sculpture were no longer needed and were thoroughly broken up. On October 22nd and 23rd the expedition was honoured by a visit by the British ambassador, James Watt, and his wife, Amal. The field school is scheduled to run until November 15th. From October 28th, it will overlap with the start of the next season of excavation at the South Tombs Cemetery, directed by Dr Anna Stevens. The attached picture shows the group writing landscape description above the South Tombs Cemetery. We are delighted to report that we have reached the 'Œpledge target' for the Big Give Christmas Challenge appeal in support of conservation work at the Great Aten Temple. What does this mean? It means that donations made online in the week beginning December 6 will now be matched, partly from our pledges and partly from external funding sourced by the Big Give. In effect, online donations can be doubled during the December fundraiser. Thank you so much to those supporters who offered pledges: it is a great start to the campaign. And please do consider offering a small donation online in December. Every donation makes a real difference to the work that we can achieve on site. The dig house at Amarna was reopened last week for the beginning of the Autumn field season. The house is currently occupied by a team of volunteers who are transferring the paper records of the artefacts excavated at Amarna since 1979 into an electronic database. After a week and a half of work, around 6000 object records have been digitised, of a total of around 24000. Most of the 6000 objects have come from the excavations in the late 70s and early 80s at the Workmen's Village, and it has been fascinating to revisit these finds. We are aiming to reach the mid-point of the records by the time we leave, at the end of next week, by which time we should be working with the object records of excavations in the Central City and at Kom el-Nana in the late 1980s. A further season of digitising will then be needed in 2013. This is the first step in creating an integrated online archive of the artefacts, environmental and biological remains, house plans, and other records for Amarna ­ the Amarna Digital Atlas. We hope that, one day, everyone will be able to better explore and study the archaeology of Amarna online. Thanks are due to our volunteers - Ashley Hayes, Megan Paqua, Melanie Pitkin and Reinert Skumnes -­ for all of their hard work. It is so rewarding to see the written records compiled by many object registrars over the years transferred into a form that can be far more easily searched. Next up will be a field school in survey techniques, running from mid-October until mid-November, and an extended season of excavations at the South Tombs Cemetery, which will include illustration work and further conservation of the wooden coffins. The season will finish just before Christmas, so it is a busy time ahead.